Beautiful, accurate download stats and analytics. 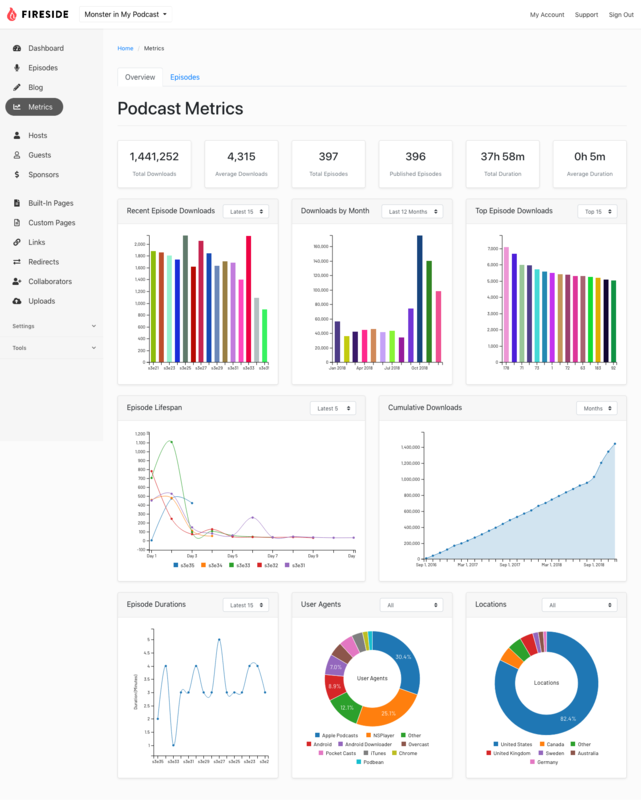 We’re podcasters like you, so we know how important accurate, real-time download stats and analytics are. Our stats engine and analytics reporting is at the very core of the product, making sure every unique download is tracked and counted accurately. 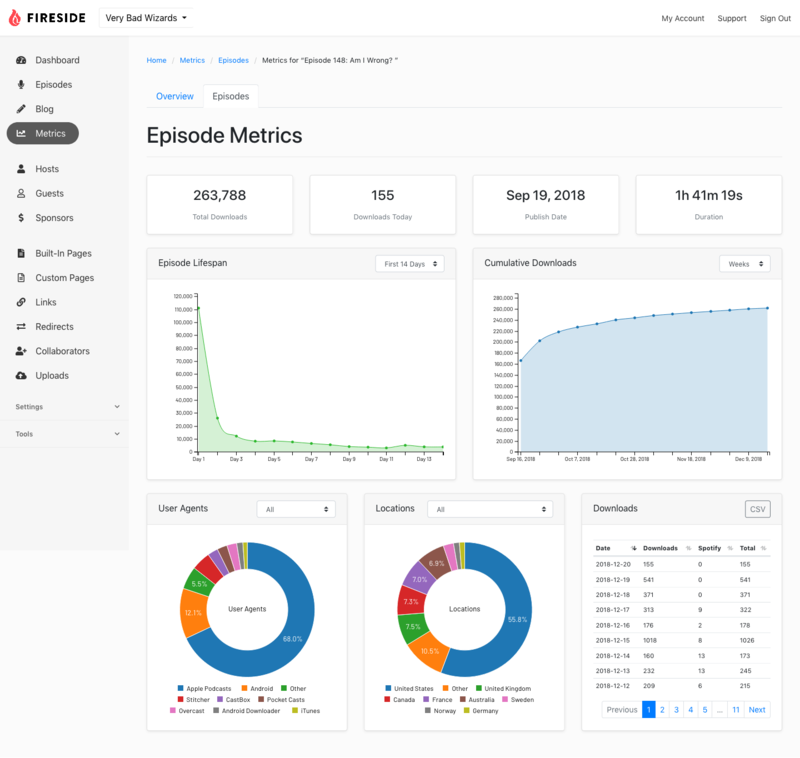 Fireside's stats engine is based on the same highly trusted, industry recognized system that's powered 5by5 since 2008, delivering and tracking millions of downloads per month. A straightforward, clean user experience. Podcasting should be fun. The Fireside dashboard was designed with this in mind, created to be fast, easy to use, and optimized for the podcasting workflow. This allows you to focus your energy where it counts — on creating amazing content instead of on tedious tasks like adding metadata, manually managing downloads, or worrying about links in show notes. Every single feature in Fireside was designed based on direct input from proficient, active podcasters based on their experience-driven needs. Handy features for a streamlined workflow. 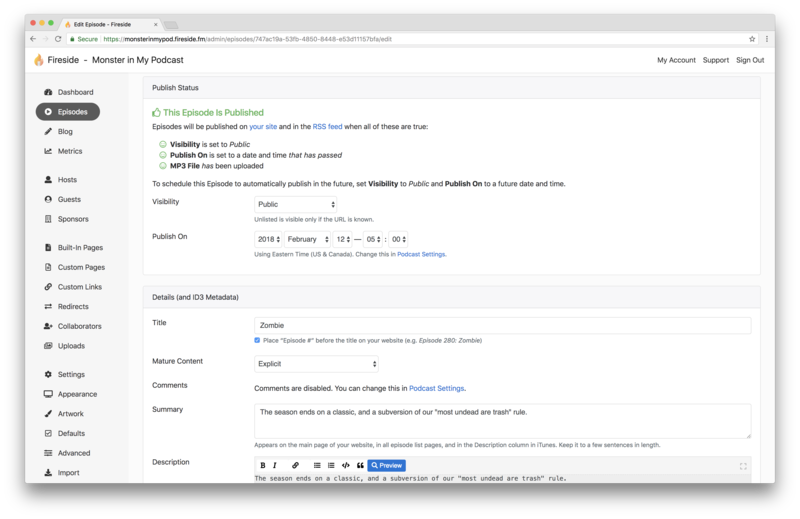 Control every aspect of your podcast's details, including cover art, metadata, chapter markers, visibility, and more. Organize your show notes and links with drag and drop, and create custom pages and redirects. You can also share your statistics with your sponsors using a special private stats page created specifically for this purpose. Every Fireside podcast is guaranteed to generate a perfect, Apple Podcasts-compatible RSS feed for easy submission to Apple Podcasts (and anywhere else). You can even set episodes to publish in the future automatically, even when you’re away from your computer and devices. Imagine pre-recording shows and having them release while you’re on vacation. No problem. 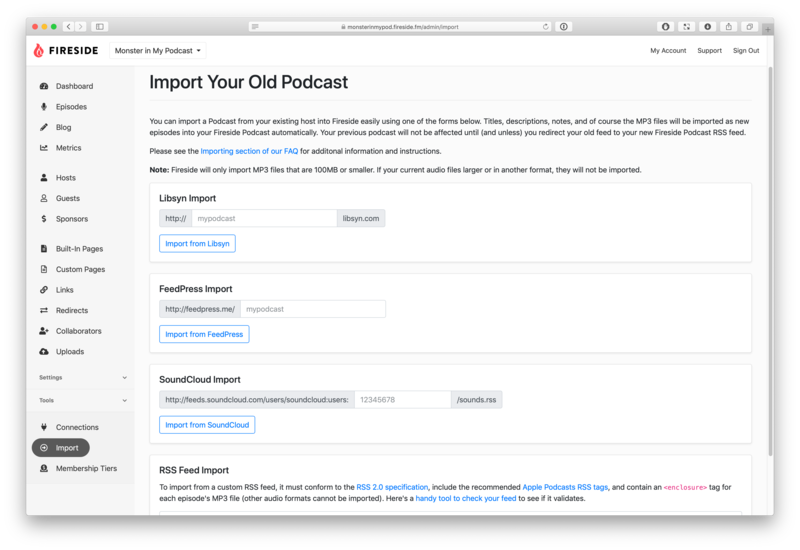 Import your existing podcast no matter where it’s hosted. You can import a Podcast from your existing host into Fireside in one step, and at no additional cost. 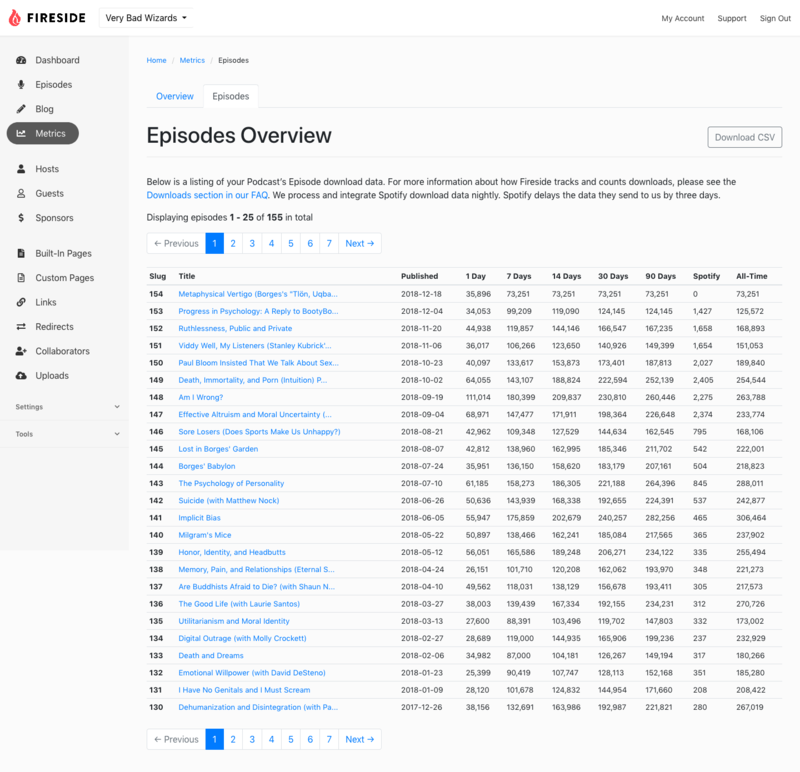 Titles, descriptions, notes, and of course the MP3 files will be imported as new episodes into your Fireside Podcast automatically. Your previous podcast will not be affected until (and unless) you redirect your old feed to your new Fireside Podcast RSS feed, so you can take as long as you'd like to experiment with Fireside until you’re absolutely certain that you love it. You can use your own custom domains with Fireside as well, just by entering your domain name into the dashboard and updating your DNS settings. 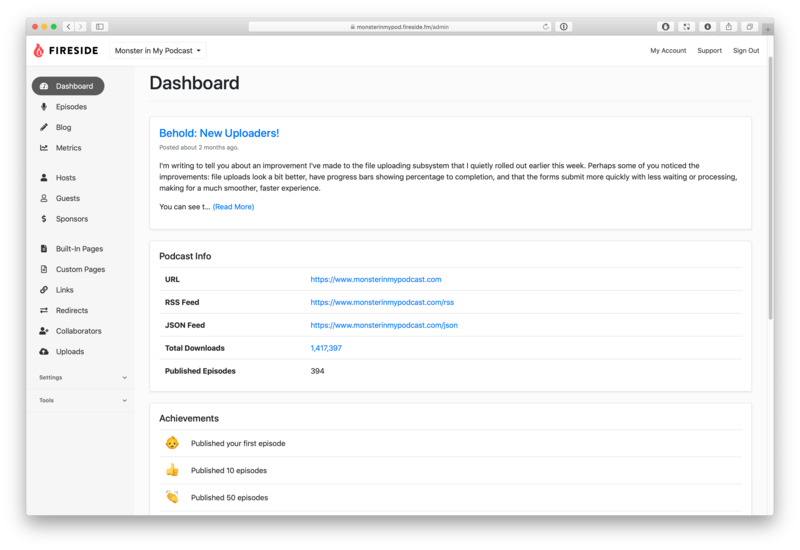 This feature, combined with custom links and pages makes it simple to migrate your podcast, blog, and website to Fireside. 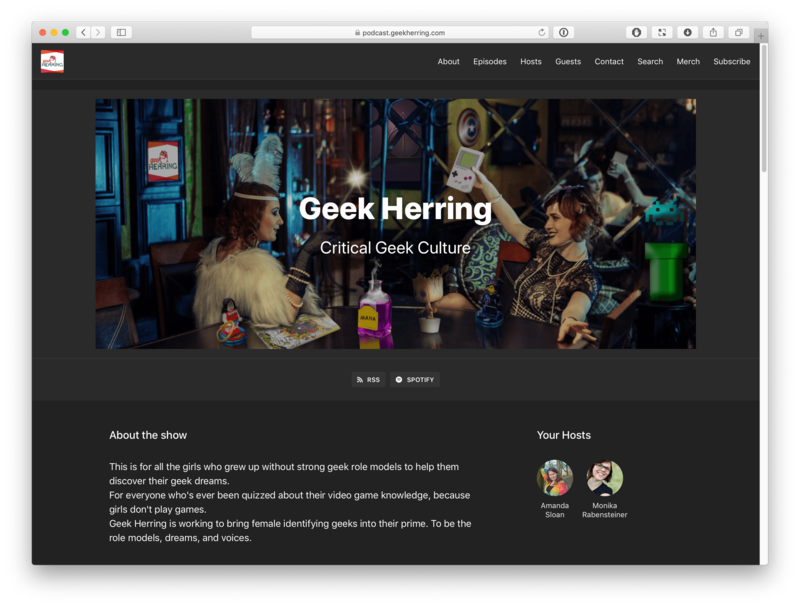 Every podcast gets a gorgeous, responsive website and blog. Fireside was designed to be a complete podcast hosting solution, and that includes a feature-rich, responsive website so your listeners can learn more about your show. There are individual host and guest pages with their own RSS feeds, tag pages (also with their own RSS feeds), custom pages and links, a full blogging engine, customizeable artwork and header images for the website and every episode page, and much more. Fireside eliminates the need for multiple, separate services for MP3 hosting, download tracking, CDN, website, and blogging, as all of these features are included. There's even built-in Spotify integration so you can publish your Podcast to Spotify with just one click. Embed with our custom player. Share your episodes on any webpage or publishing tool, from Squarespace to Wordpress, using our embeddable player. Manage episode links and show notes with our handy bookmarklet. If you’ve ever been browsing the web and thought ”this would be a great link for our next episode,“ you’ll love this feature. Just add our bookmarklet to your browser’s bookmarks bar, and anytime you find a page you’d like link to in show notes, just click the bookmarklet. You can even highlight text on the web page, and it will be added as a description for each link. Then, back in your dashboard, you can reorganize your links easily using drag-n-drop. Try Fireside today and take your podcast to the next level.